Kanye West is setting the record straight on everything he said this past weekend, including his remarks about abolishing the 13th amendment. The rapper, who now wishes to be called Ye, talks to TMZ's Harvey Levin about his controversial statements on Monday's episode of TMZ Live. To start, the rapper reveals he has been calling Colin Kaepernick so he can bring him to the White House and remove the "sons of b--tches statement and be on the same page." People might remember the President once referred to Colin and other football players who took a knee during the National Anthem as "Sons of B--tches." Kanye then begins to explain his intentions when he said he wanted to abolish the 13th amendment this weekend. He says, "Abolish was the wrong language. I misspoke by saying abolish. Amend is the right language." He continues explaining that the 13th amendment abolished slavery, with the exception of criminals, who are allowed to be used as slaves as a punishment. "In order to make a freed man a slave, all you have to do is convict them of a crime," he claims. This, he says, works because people "react" to the situation they are in or because they don't have an "understanding of how to create industry." Ye adds that this is perpetuated by people being "brainwashed to feel like they are taking a side" between red or blue, as in the Crypts and the Bloods, not the Republican or Democratic Party. Then, he says, that idea gets "promoted in the music and the music isn't even owned by the people saying these things. And then the next thing you know you get people in jail." He moves on to the next topic in his conversation: the Yandhi album, which was supposed to be released on Saturday. "I didn't finish it," he reveals. Ye adds that because his album is "so good," they decided to go to Africa to finish recording so he can "grab the soil and be and cook food." He promises the album will come out on November 23rd. As for his appearance on Saturday Night Live, the rapper says he was bullied for choosing to wear his custom-made "Make America Great Again" hat. "The bullying came from people around me close to me in my circle telling me why I shouldn't be wearing the hat. It put my energy in more of a reactionary place. For me, I've got the right to wear what I want. I have the right to think what I want and feel what I want," he proclaims. 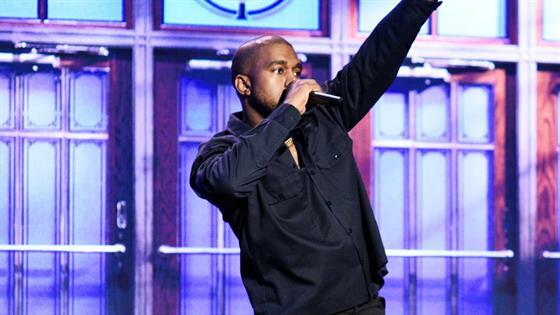 Ye assures it wasn't the cast of SNL or Lorne Michaels who criticized his choice of outfit. One of his team member's continued trying to rein in Kanye on TMZ Live, too. After Kanye proclaims, "First of all, I am American. I support our president. As an American, I support our president," one of his crew tells Kanye to not speak about supporting the president when he isn't informed. In response, West says, "We can get more information about it. We can get more." Now, it appears the rapper is going back to SNL soon to host, which he couldn't be more excited about. In his words, "it's going to be LIT." He continues, "I feel like it's going to be my calling, because I am so funny." At one point in the interview, Ye stops the conversation to ask a woman in a white t-shirt to come forward because he feels her energy is giving him strength. West also reveals, "The Ye is fully out and off medication. I am fully being myself." He rounds out the the Q&A by reminding Harvey, "The universe is on our side, and things will get better." The tell-all interview comes after the rapper sparked outrage with a supportive speech of Donald Trump, which he delivered on the Saturday Night Live stage while wearing a MAGA hat. The crowd responded by booing him. In the aftermath of his speech, A-listers like Chris Evansand Lana Del Ray criticized the star's statements on social media. Evans wrote, "There's nothing more maddening than debating someone who doesn't know history, doesn't read books, and frames their myopia as virtue. The level of unapologetic conjecture I've encountered lately isn't just frustrating. It's retrogressive, unprecedented and absolutely terrifying."